Phosphoric acid-based treatment for rusted metal surfaces prior to priming and painting. 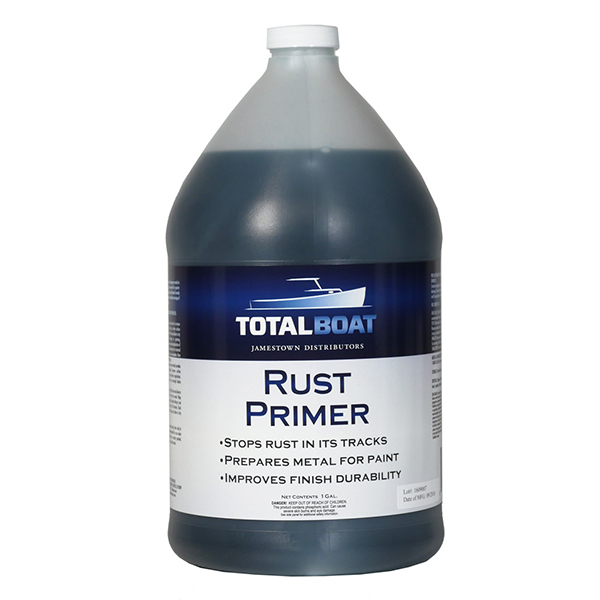 Converts rust to an inert substance and leaves a protective coating that prevents further rusting. Use on bare, clean metal to prevent rust. 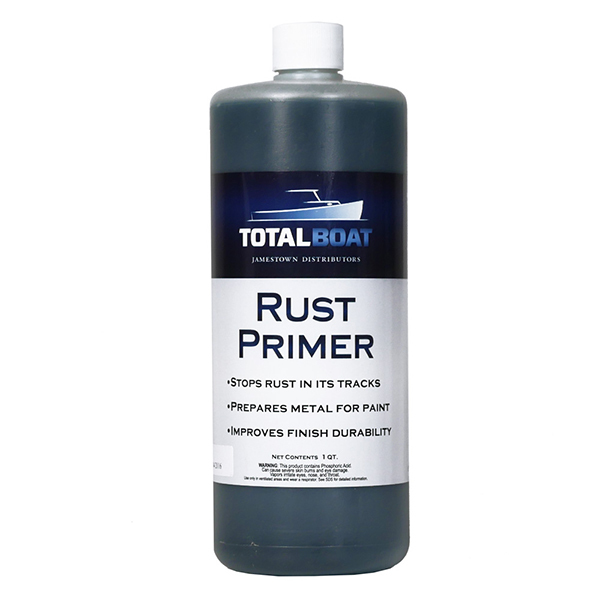 TotalBoat Rust Primer transforms rust by chemically converting something bad—iron oxide (rust!) to something good—iron phosphate—a very stable something that prevents further corrosion. Once Rust Primer’s work is done, you can prime or paint right over it. No rubbing, no scrubbing, no hassle. And you know when it’s done doing its thing because it turns black. It may be painted over once completely dry. To be clear, our Rust Primer is not a paint, it’s a treatment for metal. And it’s very, very thin so you get excellent coverage—especially into places you can’t reach but rust can. Just use a wire brush first to remove any flaky rust or loose paint, brush or squirt Rust Primer on with a spray bottle and leave it to dry overnight. Not only will it leave the surface rust-free and protected, it’ll make the surface such that primer and paint will adhere to it extremely well. Traditional rust converters or removers contain harsh acids that remove rust but leave the surface exposed to water and oxygen, allowing rust to form. You can’t get away from water and oxygen, they’re everywhere, but Rust Primer keeps them away from your metal surfaces because it neutralizes the rust and coats the surface, sealing out air and moisture. So rust stays put and can’t spread further, and future rust can’t form under your new, beautiful paint job, or on metal parts that are too expensive or inconvenient to replace. It’s OK to get excited—this is a truly remarkable, economical product that will save you time and elbow grease.